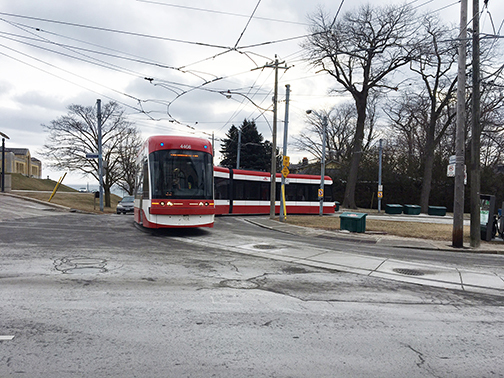 The size of the new Bombardier streetcars is causing congestion issues near the Neville Park Loop on Queen Street East. Re: ‘New streetcars adding to traffic woes near the Neville Park Loop,’ Beach Metro News, Feb. 5. Clearly, the streetcar loop at Neville Park was never designed for the new streetcars, of which only one can fit at a time. This will increasingly create congestion along Queen Street East, as multiple streetcars may be waiting to enter the loop. Removing some parking to allow for cars to pass the waiting streetcars in the curb lane makes sense. What does not make sense is to reduce the frequency of streetcar service (as was done on the new 504B-King route entering Broadview Station at Danforth Avenue, where similar capacity problems caused congestion with the new streetcars entering the station). This is a challenging situation to resolve, but it would be most unfortunate if the TTC decides to schedule fewer streetcars into the Beach as a result.